Who are these parents because I see their kids EVERYWHERE?!?! 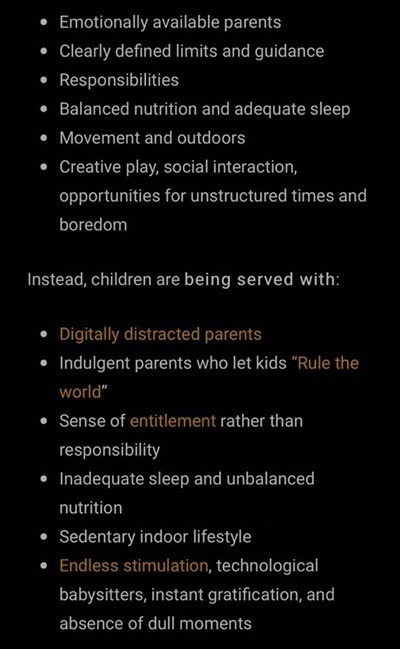 Folks, this stuff isn’t rocket science but yet it’s almost the exception to the rule to see well adjusted, happy, healthy and non anxiety filled youth these days! I started cutting my own lawn in third grade and I waved to every passing car feeling “so cool” that I was doing it!!! By 4th grade I was going door to door selling blueberries I had hand picked (I grew up in Jersey) for 25 cents cheaper than the supermarket. By 6th grade I was babysitting (crazy!) and even changing diapers! I had a paying job every summer from the age of 15 and I always had a side hustle mowing lawns, cleaning gutters and raking leaves. I played sports too year round. Oh ya, I drove myself everywhere I needed to be on my bike. EVERYWHERE!!! Sure times are different (travel sports, video games and ADHD medicine that surely every teacher I ever had would have preferred me to be on 😜) but come on people WE have created an entire generation that’s been handed stuff we all worked our asses off to get!!! And who could argue they aren’t better off for it today?! Who remembers as well being bored as hell for endless hours riding in the backseat of the family station wagon, staring out the window and coming up with “car games” (punch bug anyone?!) playing Kick the Can with the neighborhood kids till bedtime and building forts, climbing trees and doing all of it on our own without any adult direction?! Somehow we not only survived but learned along the way how to do stuff, take care of our own problems and through it all figured out that life isn’t a “bed of roses” and satisfaction isn’t immediate and everlasting!!! I’m glad I grew up when I did. I’m assuming you do as well. So please let’s all not forget that when WE are parenting our future…the next generation! As for our family we still prioritize sitting down to dinner and talking about our day every chance we get!